When the alarm went off at 7AM, Kay and I both groaned. Neither of us had slept particularly well, and his back was already hurting. Not a good way to start the day. I decided that I felt gross and wanted to shower before we headed out, and I needed to wash some socks and underwear anyway, so we headed out for a quick morning walk with the dogs and I was going to shower. Alas, my shower with clothes washing took FAR longer than I had anticipated, and when I got back to our campsite, I found that Kay had already taken everything out of the tent and disassembled it. Unfortunately, this meant that I had zero shelter from the mosquitos. I jumped back and forth from task to task frantically, without really finishing things, because the mosquitos were driving me to distraction and I just wanted to be *gone* before they could get more of me. Not a whole lot to report during the afternoon. I was cold all day, but I kept not putting on another layer underneath my jacket because every time we stopped, the ambient air temperature felt quite warm. But whenever we started again, we were going fast enough that I was quite chilly. Like goose-pimply chilly. I don’t know if it was remnants from being rained on the day before, or the fact that my body was finally succumbing to the long days and the tough pace, but I was starting to feel unwell. By the time we stopped for gas and some noms around 3:30PM, I was feeling downright sick. I felt flushed and cold at the same time, and Kay says I didn’t look good. We had fish and chips at a restaurant at our gas stop – and poutine, because HELLO! When in Canada, have poutine! But all the greasy gross food weighed heavily on my poor unwell self, and I started feeling nauseous and gross as we headed out after our late lunch stop. We were back on the road at around 4:30 with still far too much ground to cover. Our next gas stop was at around 6pm. I still wasn’t feeling well – felt like I was coming down with something plus just exhausted from our long days in the past few weeks – and we still had around 75 kms to cover. At the pace we were going, it would take probably an hour to an hour and a half. 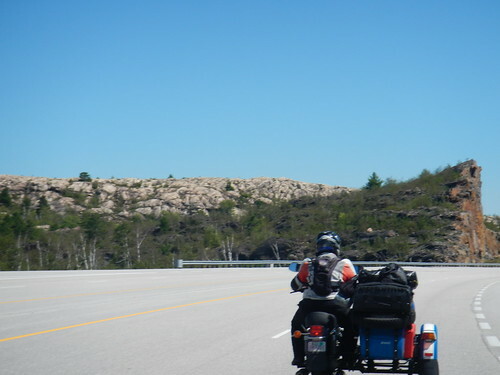 And we were off interstate at that point, so the roads were prettier but they were hilly and curvy and it required a lot of energy to muscle the Ural through the turns. My poor exhausted body wasn’t up for much more of this. We had conveniently stopped for gas RIGHT NEXT to a campground, so we inquired about getting a spot for the night but they were full up. And they told us about something important that we had completely missed – it was a long weekend in Ontario. They said that ALL the campsites in this part of the country were likely to be full up. I looked at Kay. I told him that I wasn’t confident that the “close” campsite I had found was actually a public tenting site – it might be some sort of summer camp type of camp. The one that was definitely a public type campground was over 100 kms away, which I was skeptical of us reaching before dark and even if we could I wasn’t sure I was capable of driving the Ural that far. But I didn’t see that we had a choice, so we hit the road again. About 20 kilometers down the road, we rolled into Bracebridge. I had been watching the road signage as we’d ended up on a short stretch of interstate again, and I pulled off when I saw a sign for gas, food and hotels. 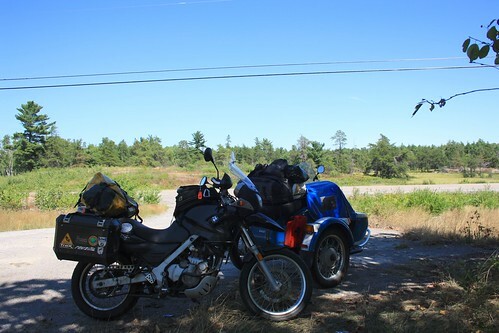 I led us into a Home Depot parking lot, and told Kay that I was totally wiped out, not sure about the campsite and that I’d need him to drive the Ural the rest of the way if we wanted to try to get out there because I couldn’t drive it anymore. I was too exhausted and feeling too unwell. Apparently I looked it, too, because he immediately said “I saw a sign for a hotel. Let’s check it out.” I really didn’t want to spend the money on yet another hotel, and I had enjoyed camping last night so I was looking forward to camping again, but I also wasn’t in a position to argue, and I was skeptical about our ability to find a campsite since it was a holiday weekend. So we went to the nearby Travelodge, where Kay inquired whether they were dog friendly (yes) and about their rates ($130 Canadian – more than we’d paid for any hotel on the entire trip, including in downtown Denver). In spite of the high rate, Kay suggested that we take it. By that point, I just wanted to pass out, so I put up a perfunctory objection but was secretly hoping he’d override it so I could feel better about the cost. He did, so we got the room and pulled around to unload. It was actually a fairly nice motel, as they go. It was all ground floor rooms that open onto a parking lot that wraps around the building, so we were able to park right in front of our room and easily unload into our open door. There was a sliding glass door out the back of our room onto a courtyard type thing with plenty of shade, which was a great place to walk the dogs, and there was a pool that we totally didn’t take advantage of, but sounded great if I’d been feeling better. Kay made sure I was safely ensconced and then went out to find cash (as we’d used the last of our Canadian money on the hotel room and still had another day in Canada to finance) and food. It turns out that the town was ALSO having a street fair, so he had a heck of a time getting to the ATM to pick up cash, and the restaurant we’d chosen for him to acquire takeout for dinner for us was packed to the gills so there was little chance of getting food. He came back empty-handed (but with a full wallet) and we ended up ordering delivery from a pizza place just because we were both too tired to deal at that point. Another $55 Canadian. This was an expensive evening. But I pretty much ate and then passed out in air-conditioned splendor, thanking my lucky stars for a hotel. And I did get a good night of sleep this time. Kay’s note: Dachary spent much of the day frustrated by how behind schedule we were, and how many miles we still had to cover. She was determined to get me back home on Sunday so that I wouldn’t have to call in and ask for yet another day off of work. The end result was that when I initially pointed out the beauty of what we were passing through she reluctantly grunted in agreement, but had trouble enjoying it. Let this be a lesson to you folks. The worst thing your adventure can have is a deadline. Ugh. With regards to the hotel, health and safety are my number one priority when riding. Take breaks when you need them, and pay money when you need to to compensate for the body’s limitations. It sucked to spend that much on a hotel for only one night, but I didn’t hesitate to pay it, or regret a penny of it. She needed it, so I got it.